Marble is a natural stone that has been used for centuries as the preferred design element for decadent palaces, grand coliseums and culturally significant sculptures. In modern times, marble is regarded as a classic, timeless stone. Using progressively finer abrasives, marble can be polished into a very high luster. This stone is often used for floor tiles, window sills, countertops, stair treads and columns. Marble is a metamorphic rock formed when limestone is subjected to heat and pressure (metamorphism). It is primarily comprised of the mineral calcite, or calcium carbonate. During metamorphism, calcite in limestone recrystallizes into a mass of interlocking calcite crystals. Depending on the mineral composition, marble generally ranks a 3 or 4 out of 10 on the Mohs Hardness Scale, a scientific measure of the resistance of a material to being scratched. The feathery veins of impurities characteristic of marble are formed from various mineral deposits, including mica, quartz and iron oxides. Being porous and given the sensitivity of calcium carbonate, marble does require some care. Sealing helps repel stains, but it will not make it stain proof. For this reason, care should be taken to avoid staining. For example, dark liquids (think red wine) should be wiped up immediately. And, cutting boards, coasters, or other barriers should be used when you have something that potentially could transfer color. The maintenance of a good seal is important. A good way to determine when it is time to reseal is to observe when water no longer beads on the marble surface. Dirt and debris should be cleaned off marble regularly and only non-abrasive cleaners should be used. Spot cleaning remedies are often successful in removing the occasional stain. Moreno Granite prides itself in educating our marble purchasers on the care of their new stone. 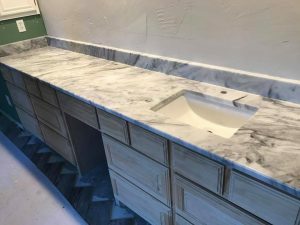 The mineral makeup and density of the deposits will influence the marble color, offering those traditional white variations most commonly associated with marble, to tones and highlights of blue, gray, pink, yellow and even black. We walk our customers through all the options mother nature has provided, allowing them to select the slab they will ultimately have in their home or business. It should be noted that the geologically similar natural stones travertine, onyx and limestone, all available at Moreno Granite, are often classified as marble as well.